Located at the entrance to Helsinki’s harbor, Suomenlinna was built in the second half of the 18th century by Sweden for the purpose of serving as the main base of Sweden’s armed forces that were stationed in Finland. Suomenlinna was originally named Sveaborg, its Swedish name, and changed names to Viapori when Russia occupied it following the war of 1808-1809. It wasn’t actually called Suomenlinna, which literally translates to Fortress of Finland, until 1918 when Finland gained its independence. Around 6 kilometers of the fortress walls remain, as well as 150 canons and 200 buildings. Suomenlinna is one of the largest maritime fortresses in the world. When we flew into Helsinki, the Baltic Sea was still quite frozen and we could literally see “lanes” in the sea ice made by ships and ferries coming in and out of Helsinki’s harbor. Admittedly, part of the reason we wanted to visit Finland’s most popular tourist attraction was simply for the allure of 15 minute ferry ride through huge chunks of broken up sea ice. Arriving on Suomenlinna, it was a pleasant reprieve from the hustle and bustle of Helsinki. The interconnected islands that make up Suomenlinna are inhabited, but they are very quiet with only around 850 total residents and very few cars. Suomenlinna has quite a few restaurants, cafes, and museums though not all are open in the winter time and we did have limited time to explore, so headed straight toward the monumental King’s Gate, which is the entrance to the fortification. I was particularly struck by the Great Courtyard, a grand open space surrounded by commandant’s house and the main guard house. The tomb in the center of the Great Courtyard is eye-catching with a soldier’s headdress on top. The huge canons were of a bit more interest to Tim. He posed taking aim toward ferries coming in to Helsinki’s port and try with all his might to convince me to try to fit inside of a canon. My head definitely fit inside, but no way was I trying to climb in. Sadly, visitors to Suomenlinna seems to use the canons to stash their rubbish. We walked hand-in-hand around the fortress walls, weaving around the gunpowder magazines, peaking out of the walls to the sea, and enjoying the solitude of so few visitors in winter. Suomenlinna truly was the perfect place to escape the hustle and bustle of Helsinki. 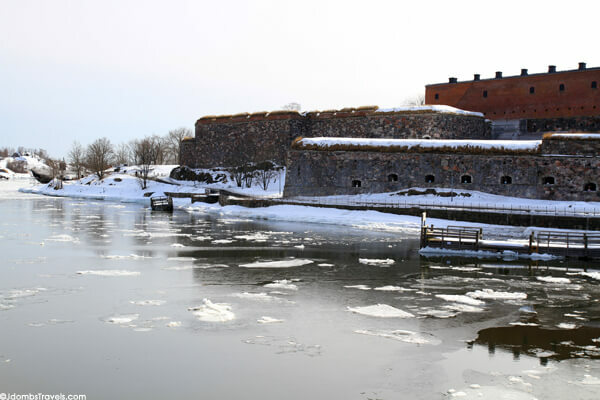 Suomenlinna is open all year round and easily reached in 15 minutes by ferry from the Market Square in Helsinki. Ferries do run less frequently in winter, so be sure to check the ferry timetable. The ferry costs €2.50 each way or is free with the Helsinki Card. There are self-service ticket machines at Market Square and on Suomelinna. There is no entrance fee for the fortress. Dogs are allowed on Suomenlinna but must be leashed. Most restaurants are only open in summer, but packed picnic lunches are allowed all year round. This is a UN ESCO World Heritage Site. For more info click here. You have visited such nice places during your trip to Finland, Jennifer. The Fortress is another place where I would love to go to. The canon looks exactly like the ones in Morro Castle fortress in Havana Bay, Cuba. The fortress was great! Definitely a must see when in Helsinki. I would love to travel to Cuba! I hope make it there before the tourists overrun Cuba. I want to see authentic Cuba, not a touristy version. No, I definitely don’t think of castles when I think of Finland. This one is a must when visiting Helsinki, even if for just the views from the islands. We didn’t see this so thanks for the tour! It’s such a lovely bunch of connected islands. Even the short ferry ride over is lovely as you pass by some of the other islands and have beautiful views. Definitely awesome! It does look cold, but with the spring sunshine, it was actually warm walking around. Once the sun set, boy could we feel the cold though. Layers are even more essential at this time of the year. Nice post. Like the first image very much, its cool. Would like to explore finland some time.